My grandfather collected the following information about his mother’s family, the Dunlaps of Kentucky. The Kentucky Dunlaps descended from the notable Dunlop family of Scotland. William Dunlop (1654 - 1703) was a Covenanter, Principal of the University of Glasgow, and first Presbyterian pastor in South Carolina. His son William (1692-1720) was a professor of church history at the University of Edinburgh and defender of the Westminster Confession of Faith. William Jr.’s brother Alexander (1682-1747) taught Adam Smith Greek at Glasgow University. It was probably Alexander’s son John who immigrated to Augusta County, VA. His son William (1744-1816) later died in Lexington, Kentucky. The oldest son of the first Hopper ancestor of whom we have record (Blackgrove Hopper, my great, great, grandfather) was Joseph Hopper, a name which recurs six times in all. He was married twice, and his second wife was Mary Jane Dunlap (my great-grandmother). We have considerable information about the Dunlap family which is quoted here. The Dunlap family is one of the oldest and most distinguished of the Scotch-Irish Presbyterian families of the South. Several kinsmen of the name, born in Ireland, settled in Augusta County, Va., about the middle of the 18th century, and from them have sprung many prominent descendants. Among them, I will mention, Major William Dunlap II, of Fayette County (note: Lexington, Ky. is the principal city of this county), who was born in 1743. His wife, Rebecca Robertson, was the aunt of Chief Justice George Robertson. They were ancestors of the Rev. James Dunlap, General James Dunlap of the Union Army; Millard F. Dunlap, banker and treasurer of the National Democratic Committed; Brig. Gen. Edward McClernand, of the Union Army; Congressman George W. Dunlap; Eugenia Dunlap Botts, writer; Col. William Watkins Dunlap (Dunlap, Ky.) who left West Point to join the Confederacy; Major Alexander Dunlap, captured at Dudley’s defeat, aid to Jackson at New Orleans, and Major in the Mexican War; George Robertson Dunlap of the Thames, Colonel of Kentucky militia and father of General Henry C. Dunlap of the Union Army. Your musket you carried in the war for liberty was left by your boys at my house during Christmas holidays. Your boys and mine had a good time shooting turkeys and firing off guns before daylight so as to awaken our neighbors. The bayonet on the gun was broken by carelessness. I will bring the gun to Lexington next week. Envelope…Major WM. Dunlap, near Lexington, Ky. By the hand of Thomas Kizen (?) Envelope was made by folding the letter, as was the custom in those days. I once saw in the genealogical book at Main Library, Louisville, the statement that this musket is in the possession of a descendant of Major Dunlap in Lexington, Ky. Said person was a member of the D.A.R. or S.A.R. From a newspaper clipping in my possession, we have the following obituary for my paternal grandfather, George Dunlap Hopper. It was the writer’s pleasure to know Mr. Hopper for well-nigh thirty-five years and for just that long he had admired him and was the happier because of his friendship. It was our pleasure to visit his home before his adversities came, and it was our privilege to be with him frequently after he had become an invalid. It was a benediction and an inspiration to us to see one whose infirmities were so great, always light hearted; always greeting his friends with a smile. A thoroughly good man, a scrupulously honest one, and a citizen than whom there was none better it is not strange that the community in which he lived so long is bowed in sorrow that Mr. Hopper is no more. A pity it is that one whose influence for good was so great, who had done so much to make others happy, should have to bear the burden of affliction that he did. But it was His will, and Mr. Hopper realizing this, no complaint passed his lips. With him it was: “If it be my Father’s will, that I suffer, I shall bear the pain and murmur not.” How few there are like him; of the salt of the earth was he. We are glad we knew him well; sincerely do we regret that he has passed out from among us. But absent in body, his deeds still live and his memory will be cherished long after the flowers that were planted on his grave by loving hands will have perished. Even after the granite marker over his grave shall have crumbled, will his friends remember him. Mr. Hopper was born Oct. 29, 1848 at Lancaster, Ky., and on Oct. 7th, 1875, he was married to Miss Kittie Higgins, who survives him, and who has proved a helpmeet in all the word means. He moved to Stanford in 1869, and embarked into the mercantile business with his brother-in-law, Mr. Asher Owsley. This business experience was both pleasant and profitable, but he wanted to try farming and in 1877 he moved to the farm on the Danville pike just at the bridge over Hawkins’ Branch. In 1902 he gave up farming and returning to Stanford, engaged in the mercantile business again. 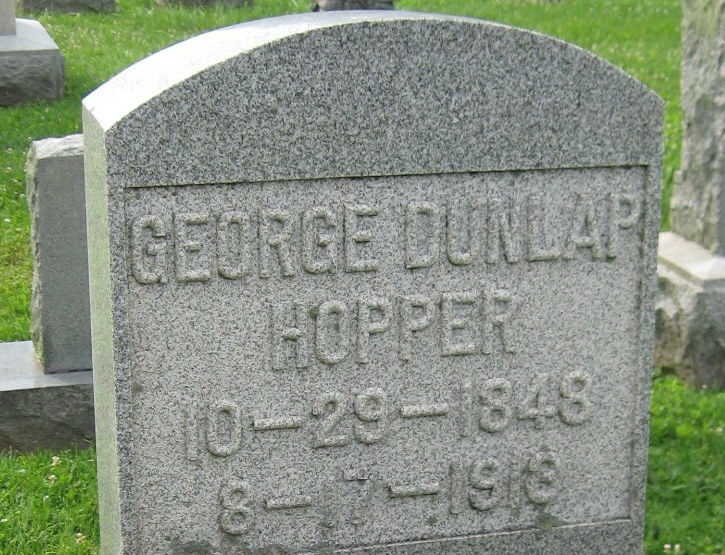 On Aug. 15, 1907, Mr. Hopper suffered a stroke of paralysis, and since that time he had been confined to his home. Besides his good wife he leaves the following children, whose affection for father and mother was beautiful to behold. Rev. W. H. Hopper, pastor of the Presbyterian Church at Burnside, Prof. Walter O. Hopper, superintendent of the High School at Mt. Sterling, Miss Margaret Hopper, of the faculty of the Stanford High School, George D. Hopper, who graduated with honors in his class from Central University last June, and Joseph Hopper, who lead his classes in that institution last year. A daughter, Mrs. Mattie Dunlap Stover, died some 15 years ago. Mr. Hopper was made a Mason in 1870 and was a devout member of that order which he loved next to his church. All of his boys are members of the order. He had been a member of the Presbyterian Church nearly 45 years. For eleven he served as deacon of the Stanford Church and later was ordained as an elder. He was a great church worker and a regular attendant at the services as long as his health would permit. Many here know good old Rev. Joseph Hopper, of Perryville, whose earnest expounding of gospel truths has led so many souls to Christ. He is brother of Mr. George D. Hopper. Mr. Hopper also leaves a sister, Mrs. Mattie Withers, of Stanford. The burial will take place this afternoon and Dr. P. L. Bruce is now preaching the funeral service at the late home. The sermon should be an excellent one. Certainly Dr. Bruce could have no better subject. The burial will occur in Buffalo cemetery where hundreds will gather to show their respect and love for the good man. The Masons are in charge of the last rites. May those who weep soon have their tears dried by the realization that their loss is his eternal gain; that he who suffered in the flesh now basks in the sunshine of the God who gave him. Truly a good man has gone to a rich reward, may his splendid life be an inspiration and his example a help to those of us who are left to sorrow over the loss we have just sustained. Resolutions by Lincoln Lodge No. 60 F. & A.M.